This review provides a summary statement of recommended implementations of arterial spin labeling (ASL) for clinical applications. It is a consensus of the ISMRM Perfusion Study Group and the European ASL in Dementia consortium, both of whom met to reach this consensus in October 2012 in Amsterdam. Although ASL continues to undergo rapid technical development, we believe that current ASL methods are robust and ready to provide useful clinical information, and that a consensus statement on recommended implementations will help the clinical community to adopt a standardized approach. In this review, we describe the major considerations and trade‐offs in implementing an ASL protocol and provide specific recommendations for a standard approach. 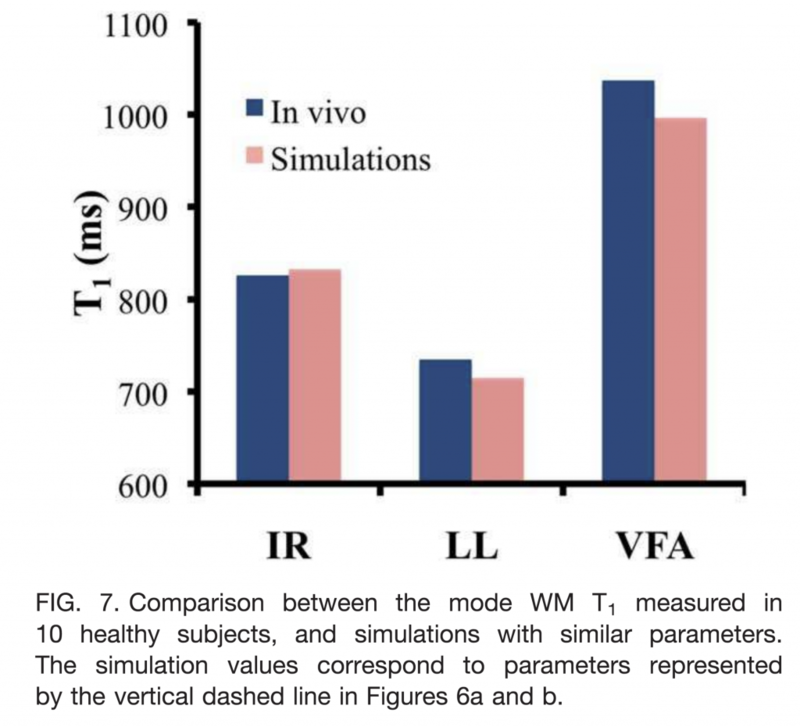 Our conclusion is that as an optimal default implementation, we recommend pseudo‐continuous labeling, background suppression, a segmented three‐dimensional readout without vascular crushing gradients, and calculation and presentation of both label/control difference images and cerebral blood flow in absolute units using a simplified model. Magn Reson Med 73:102–116, 2015. © 2014 Wiley Periodicals, Inc. In MRI, the main magnetic field polarizes the electron cloud of a molecule, generating a chemical shift for observer protons within the molecule and a magnetic susceptibility inhomogeneity field for observer protons outside the molecule. The number of water protons surrounding a molecule for detecting its magnetic susceptibility is vastly greater than the number of protons within the molecule for detecting its chemical shift. However, the study of tissue magnetic susceptibility has been hindered by poor molecular specificities of hitherto used methods based on MRI signal phase and T2* contrast, which depend convolutedly on surrounding susceptibility sources. Deconvolution of the MRI signal phase can determine tissue susceptibility but is challenged by the lack of MRI signal in the background and by the zeroes in the dipole kernel. Recently, physically meaningful regularizations, including the Bayesian approach, have been developed to enable accurate quantitative susceptibility mapping (QSM) for studying iron distribution, metabolic oxygen consumption, blood degradation, calcification, demyelination, and other pathophysiological susceptibility changes, as well as contrast agent biodistribution in MRI. This paper attempts to summarize the basic physical concepts and essential algorithmic steps in QSM, to describe clinical and technical issues under active development, and to provide references, codes, and testing data for readers interested in QSM. Magn Reson Med 73:82–101, 2015. © 2014 The Authors. Magnetic Resonance in Medicine Published by Wiley Periodicals, Inc. on behalf of International Society of Medicine in Resonance. This is an open access article under the terms of the Creative commons Attribution License, which permits use, distribution, and reproduction in any medium, provided the original work is properly cited. Purpose: To apply the Top 5 (L+S) matrix decomposition model to reconstruct undersampled dynamic MRI as a superposition of background and dynamic components in various problems of clinical interest. Theory and Methods: The L+S model is natural to represent dynamic MRI data. Incoherence between k‐t space (acquisition) and the singular vectors of L and the sparse domain of S is required to reconstruct undersampled data. Incoherence between L and S is required for robust separation of background and dynamic components. 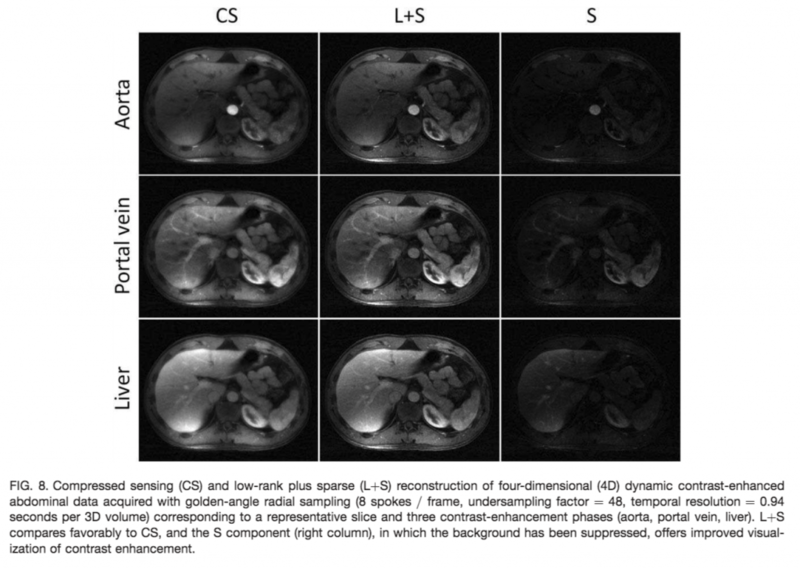 Multicoil L+S reconstruction is formulated using a convex optimization approach, where the nuclear norm is used to enforce low rank in L and the l1 norm is used to enforce sparsity in S. Feasibility of the L+S reconstruction was tested in several dynamic MRI experiments with true acceleration, including cardiac perfusion, cardiac cine, time‐resolved angiography, and abdominal and breast perfusion using Cartesian and radial sampling. Results: The L+S model increased compressibility of dynamic MRI data and thus enabled high‐acceleration factors. The inherent background separation improved background suppression performance compared to conventional data subtraction, which is sensitive to motion. Conclusion: The high acceleration and background separation enabled by L+S promises to enhance spatial and temporal resolution and to enable background suppression without the need of subtraction or modeling. Magn Reson Med 73:1125–1136, 2015. © 2014 Wiley Periodicals, Inc.
Purpose: There are many T1 mapping methods available, each of them validated in phantoms and reporting excellent agreement with literature. However, values in literature vary greatly, with T1 in white matter ranging from 690 to 1100 ms at 3 Tesla. This brings into question the accuracy of one of the most fundamental measurements in quantitative MRI. Our goal was to explain these variations and look into ways of mitigating them. Theory and Methods: We evaluated the three most common T1 mapping methods (inversion recovery, Look‐Locker, and variable flip angle) through Bloch simulations, a white matter phantom and the brains of 10 healthy subjects (single‐slice). We pooled the T1 histograms of the subjects to determine whether there is a sequence‐dependent bias and whether it is reproducible across subjects. 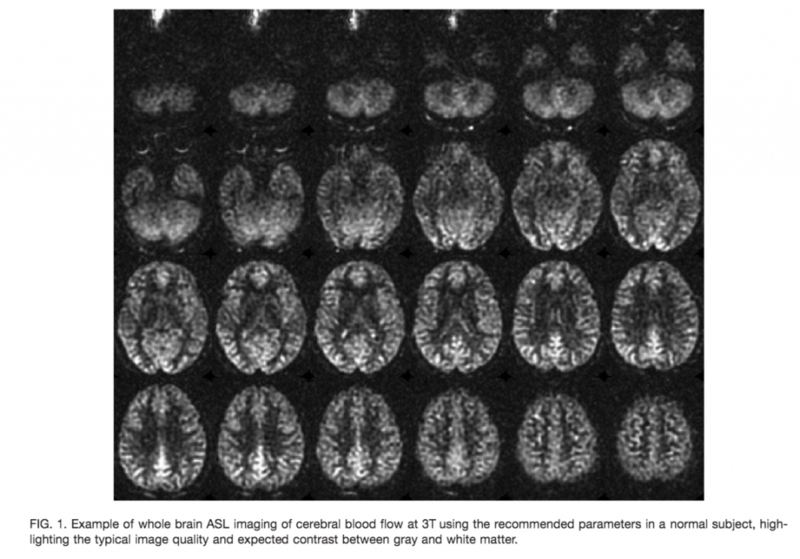 Results: We found good agreement between the three methods in phantoms, but poor agreement in vivo, with the white matter T1 histogram peak in healthy subjects varying by more than 30% depending on the method used. We also found that the pooled brain histograms displayed three distinct white matter peaks, with Look‐Locker consistently underestimating, and variable flip angle overestimating the inversion recovery T1 values. The Bloch simulations indicated that incomplete spoiling and inaccurate B1 mapping could account for the observed differences. Conclusion: We conclude that the three most common T1 mapping protocols produce stable T1 values in phantoms, but not in vivo. To improve the accuracy of T1 mapping, we recommend that sites perform in vivo validation of their T1 mapping method against the inversion recovery reference method, as the first step toward developing a robust calibration scheme. Magn Reson Med 73:514–522, 2015. © 2014 Wiley Periodicals, Inc.
Purpose: Frequency and phase drifts are a common problem in the acquisition of in vivo magnetic resonance spectroscopy (MRS) data. If not accounted for, frequency and phase drifts will result in artifactual broadening of spectral peaks, distortion of spectral lineshapes, and a reduction in signal‐to‐noise ratio (SNR). We present herein a new method for estimating and correcting frequency and phase drifts in in vivo MRS data. Methods: We used a simple method of fitting each spectral average to a reference scan (often the first average in the series) in the time domain through adjustment of frequency and phase terms. Due to the similarity with image registration, this method is referred to as “spectral registration.” Using simulated data with known frequency and phase drifts, the performance of spectral registration was compared with two existing methods at various SNR levels. Results: Spectral registration performed well in comparison with the other methods tested in terms of both frequency and phase drift estimation. Conclusions: Spectral registration provides an effective method for frequency and phase drift correction. It does not involve the collection of navigator echoes, and does not rely on any specific resonances, such as residual water or creatine, making it highly versatile. Magn Reson Med 73:44–50, 2015. © 2014 Wiley Periodicals, Inc.